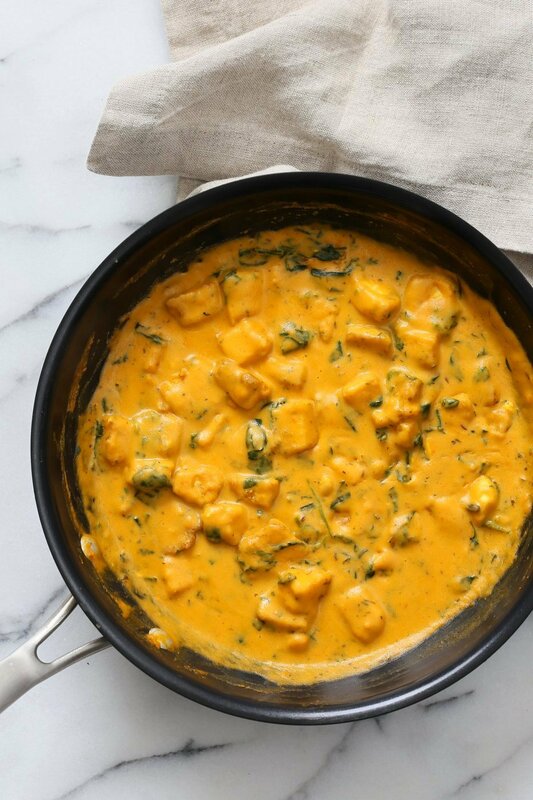 Methi Malai Paneer made vegan with Tofu and Cashews. Tofu and Fenugreek/Greens in Creamy Sauce. Easy Weeknight Restaurant style Indian entree. Serve over Naan or rice. Vegan Gluten-free Recipe. Soy-free Nut-free option. 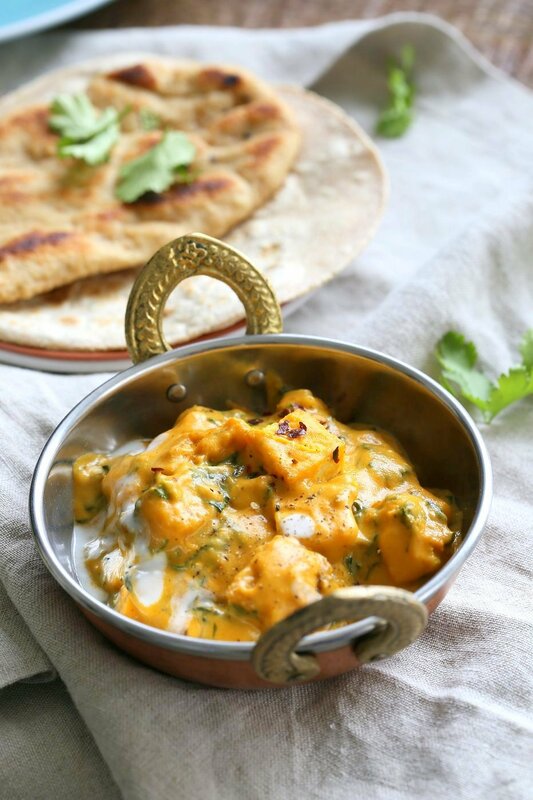 Methi Malai Matar (Fenugreek/Greens and peas in creamy white sauce), Methi malai paneer (fenugreek and Paneer cheese cubes in creamy sauce) are some Mughlai dishes you might find in some Indian restaurants. The dishes use malai or dairy cream and cheese or other dairy ingredients. Its like a spiced up Spinach dip, with lots of complex flavor! But this version is free of all that, tastes amazing, and comes together quickly as well. Fresh fenugreek leaves are a favorite to use in the dish when in season. If you find some then definitely use them fresh, else use dried fenugreek with greens of choice. Serve with hot garlic Naan or rice/grains or make a bowl with roasted veggies, add to wraps or on a pizza!. Dried fenugreek (kasuri methi) is available in Indian stores and online on amazon. Definitely get some, as I use it in many recipes, so it will not just get stored and expire :). Fenugreek has an amazing flavor profile, bitter but pleasing. You can use ground mustard + celery seed as a substitute when used in small quantities. Use Chickpea tofu or chickpeas +veggies to make this soy-free. You can also use vegan almond paneer from my book or Kite hill Original Almond cheese. Add them to the sauce directly without the baking steps. To make this nut-free, use non dairy yogurt or silken tofu. Tofu is baked with garam masala and nutritonal yeast. You can also add pressed fresh tofu directly for shorter cook time. The sauce is a simple onion cashew tomato sauce with greens and fenugreek leaves. For variations make this Greens/Chard and Peas in Creamy Sauce. We were cooking up greens and peas in creamy sauce every 2-3 days when my family was visiting. It was clearly a favorite. Like this recipe? Then there are 20 more options in my Indian Kitchen book. 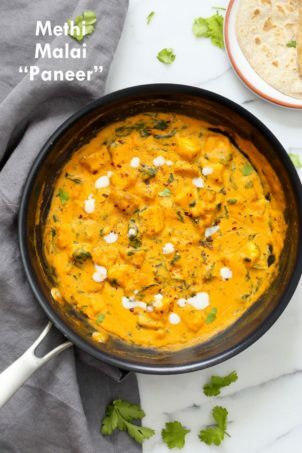 Fenugreek leaves are the only ingredient in this recipe that needs to be either ordered online or picked up from an Indian store. To sub use 1/3 tsp powdered fenugreek (fenugreek seed powder), or 1/4 tsp ground mustard + 1/8 tsp celery seed. Whats your favorite Indian meal this month? Troubleshoot Indian recipes in my book or the blog: Most of the time the recipes are just perfect for most people, while for some it seems like there isnt enough spice/flavor. If so, you might need to adjust the following. Add more salt, as the right salt immediately brings out the spices and complex flavors. Add more of the spices, if the spices are old, their payoff is pretty less, or maybe you are just accustomed to eating a higher amount of spices in Indian food. Everyday Indian cooking isn’t always full of spices, and every dish does not have a flavor payoff that goes Pow. But it is understandable that if someone is cooking Indian food only occasionally, then the expectation is for more. So taste and adjust to preference. Add more oil, as oil carries the spices faster into the dish. It is often about what one is accustomed to. Depending on whose recipes you cook from (Indian cooks living in India, Indian origin chefs outside India etc), food might generally have higher salt, oil and spice amounts. My mom generally adds more salt to some of my dishes. These recipes here are pretty solid to use as a base and then you can play around and make them your own. Thats the amazing part of Indian cooking. Get some basics right, then everything falls well together. Lets get to making this fabulous dish. 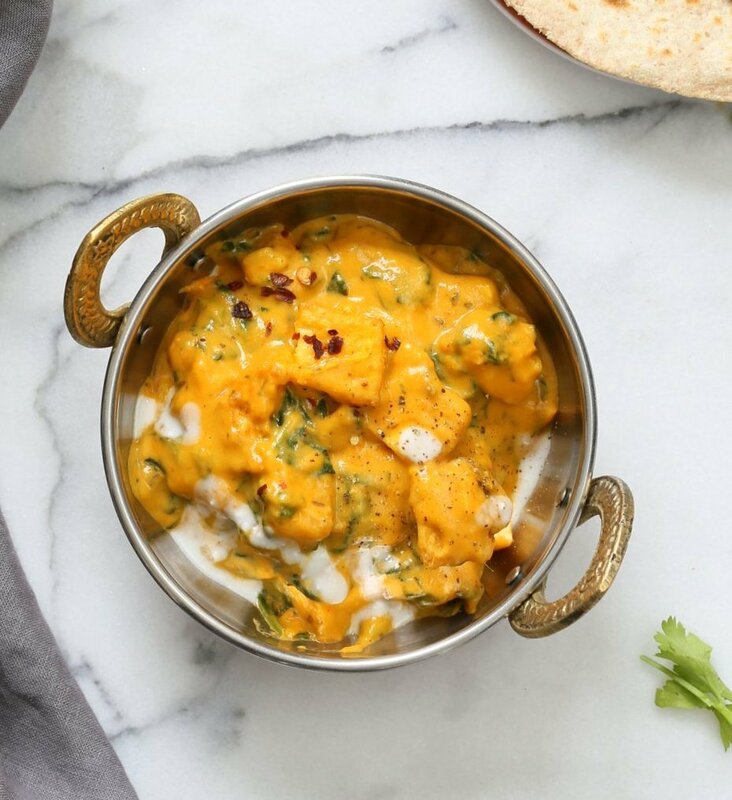 Methi Malai Paneer made vegan with Tofu and Cashews. Tofu and Fenugreek/Greens in Creamy Sauce Easy Weeknight Restaurant style Indian entree. Serve over Naan or rice. Vegan Gluten-free Recipe. Soy-free Nut-free option. Press the tofu for 10 minutes to remove excess moisture, then cube into small even pieces. Heat oil in a skillet over medium heat. When hot add cumin, cloves and cinnamon and let them cook until cumin seeds change color. Add onion, garlic, ginger and chile and cook until translucent. Add pureed tomato and cook for 3 to 4 minutes. Add the ground spices, greens and fenugreek leaves, salt and sugar and mix well. Cook for 2 to 3 minutes or until the greens are wilting. Add cashew milk to the pan. Bring to a boil. Taste and adjust salt, heat, spice and sweet. Add more non dairy milk if too thick. Add in the baked tofu and let it simmer for 2 minutes. Serve hot with Naan or rice or make an Indian Bowl with chutney or pickled onion, cooked grains, garam masala roasted veggies. Variation: Use chickpea tofu or chickpeas +veggies to make this soy-free. To make this nut-free, use non dairy yogurt or silken tofu. Quick option: Skip baking the tofu, Add just pressed and cubed tofu to the sauce and simmer for 5 to 7 minutes. Will frozen chopped methi work here? yes. add a few minutes cooking time to thaw and cook the greens. How much of the frozen methi would you use as a sub for the fresh/dried? i would do a half cup frozen with a cup of other greens. Fenugreek is a strong flavor, so start with a mix of greens. This looks wonderful! Do you find that there is a huge difference in using oil in the tofu than without? no you can skip the oil. if the spices dont stick well, just spray some water on the tofu. Made this tonight and it is incredible! I knew it was going to be delicious when I mixed the tofu spices, but wow with the sauce it’s dynamite. Thank you Richa! This looks amazing! I know you said you could substitute ground mustard + celery for the kasuri methi, but what about instead adding adding fenugreek seeds when you add the cumin seeds? I have the seeds on hand, and don’t want to wait to order the kasuri methi to make this dish. Or grinding the fenugreek seeds and adding that. (Trying to avoid the celery seed.) I don’t know what the difference in taste is between the seed and the leaf, as I’ve never used the leaf, but I know sometimes the differences can be substantial. I really loved this! Your recipes are outstanding! We put this over steamed broccoli and had it with naan. Made this recipe and loved it! I was super worried at first because it didn’t look right. Re-read the instructions and realized I forgot the milk! Once I added that, the gravy turned nice n creamy. Really tasty recipe! I will be making it again! I made this last night. Delish!! I used your chick pea flour tofu. I also used 2 teaspoons of dried fenugreek & spinach to replace the fresh that I’ve never seen for sale here in France. Thanks Richa, I’ll definately be making this again! At first bite, the sounds, “Mmmmm” came spontaneously from me. I added broccoli and carrots just before adding the liquid. Thanks for this wonderful recipe!! Should I de-stem the rest of the methi leaves and then freeze them? yes remove the hard stems and freeze in an airtight bad or packed well in a container with as less amount of air as possible. You can also blanch them lightly and then freeze. Love your website and all your effort! Hare Krishna! Looks like a great recipe! You said in the Notes that the tofu can be replaced with chickpeas and veggies. What veg’s do you like for this kind of gravy? any hearty veggies like cauliflower, broccoli, potatoes, sweet potatoes, zucchini, greens etc. With the longer cooking veggies, you an toss them in some garam masala and salt and bake them to al dente and then add to the sauce. That way the sauce doesnt taste like the vegetable which the sauces tend to pick up when simmered for a long time with veggies. 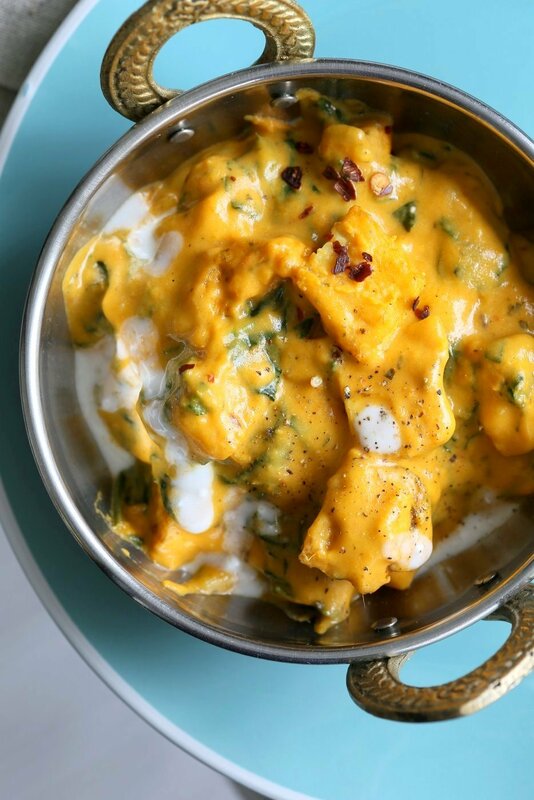 Do you think you could do a kale malai…kind of like an Indian spin on creamed kale? I imagine it would take more cooktime to wilt it down? yes you would have to wilt the kale first. Follow this recipe https://www.veganricha.com/2014/01/rainbow-chard-and-peas-in-creamy-gravy.html or mix it with this one. Add some time to when the greens get cooked until kale is wilted. Or use a mix of baby kale and chard to keep the flavor overall neutral. I tried this last month and just made it again last night!!! The first excellent curry I’ve ever made, and I have been trying for years! Even bought an Indian cookbook! THIS was amazing.